Could shallow underpasses be express tunnels for small robocars? I recently read a report of a plan for a new type of intersection being developed in Malaysia and I felt it had some interesting applications for robocars. The idea behind the intersection is that you have a traditional intersection, but dig in one or both directions, a special underpass which is both shallow and narrow. One would typically imagine this underpass as being 2 vehicles wide in the center of the road but other options are possible. The underpass might be very shallow, perhaps just 4 to 5 feet high. The underpass is available only to vehicles which fit, which is to say ordinary height passenger cars or even just ordinary height half-width vehicles. Big vehicles such as SUV, vans, trucks etc. would not use the underpass, and instead use the at-grade intersection, where you would have traffic signals or stop signs. Why is this such a good idea? It’s vastly cheaper to make such an underpass. Because it’s so shallow, it is cheap to dig and shore up the walls. You can start the downramp much closer to the intersection because you don’t need to go so far down. It’s a tiny fraction of the cost of a regular overpass or underpass which requires lots of space to go up and down, and must be high enough for big trucks to pass underneath. Not so here, as trucks never go under it. The center has the advantage of only digging one tunnel for both directions and providing that space for the left-turn lane. The downside is you have this physical tunnel entrance with protective bollards in the middle of a road, which may present some risk — though there are many places where there are tunnel entrances in the middle of roads, but they are full sized. Indeed we have intersections like this in full sized mode, including on Geary St. in San Francisco. The alternative on the edges requires two trenches and puts the obstacles to the side, mixing straight-through underpass traffic with right turning traffic. Cars small enough to use the tunnels would get a transponder to signal their ability, possibly to raise a gate. In addition, a camera system would detect any too-large vehicle trying to enter the tunnel and do whatever it can to stop it. In the end, a too-large vehicle would end up hitting soft barriers if it failed to stop or divert. Now the small, light vehicles, such as the one-person robocars, could bypass the traffic lights if they are red. They might get an “express” lane that is just for them which goes through these underpasses so it’s a smooth ride all along the road, other than the ups and downs. Robocars would have a better time knowing where they fit and letting the intersection know they fit. More to the point, their ability to drive “on rails” would allow a wider robocar to go down a narrower tunnel, keeping a tiny margin that a human driver could never handle. Human driven vehicles would need to be narrower if they used these tunnels. This would strongly encourage the use of small, lower-height vehicles, which are also very energy efficient. Really strongly — who would want to drive in a big SUV that has to stop at traffic lights when you can go nonstop in a small pod? Of course, you probably still use the light if making a turn. This in turn would cause a drop in vehicle size and congestion, and increase overall road capacity beyond what we get from having no stopping for a large fraction of vehicles. 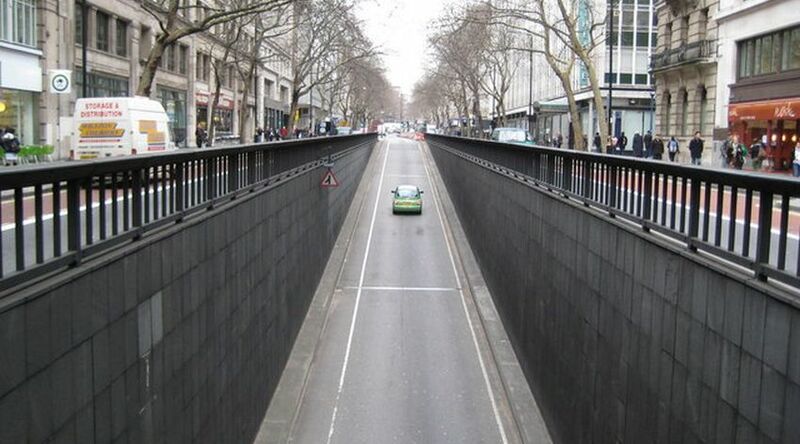 If you want to get extreme, you could even have just a one lane tunnel if it’s all robocars. The simplest approach would be to have the express lane (with tunnels) only go in the commute direction during rush hour. Off peak, the robocars could pace their trips in pulses so that they alternate what direction they move through the underpass. On a north-south road, you could imagine during the red lights having 15 cars northbound, then 15 cars southbound back and forth until the light is green and you allocate the tunnel to the most popular direction. Humans could not obey this easily but robots could. This works best when one of the roads intersecting is bigger than the other, since it’s harder to have both routes get an underpass. You could have one take a deeper underpass — at 10’ deep under a 5’ deep one, it’s still not nearly as deep as a full road underpass. Or with all robocars, you could have the robots alternate through the underground intersection at full speed under computer control. People have built computer modules of this “reservation” style intersection for many years, but they never could solve the problem that not every car in an intersection is a trustable robocar, and as such, you can never make an intersection like this. If all cars are robocars, an underground at-grade intersection could easily allow traffic to flow on both routes, in both directions, with proper timing. Since you would not see the other vehicles coming it might not even be as scary. I think these underpasses would pay for themselves in the increase in road efficiency they would generate, but if not, you could also require a toll to use them. I think a lot of people would pay a modest toll to have no red lights on their trip. Since all you need do is dig a shallow trench, shore up the walls, and cover it with metal plates or similar, it’s a completely different scale of problem from a real underpass. Without too much money, every major road could become a non-stop robocar road. You can, of course, create more capacity by building full elevated guideways only for use by small, light vehicles. These are again, much cheaper to build than full roads that can handle heavy trucks, and they take up only pillar space so they can be run down the center of many roads. They still need to be up high enough for big vehicles to go under them. Aside from the cost, the big issue is how they change the built environment, blocking out the sun and putting vehicles running in front of the 2nd or 3rd floor of buildings and houses. This is like a PRT plan but you only need to build these in the most congested zones. There isn’t a lot of details on these plans, but I read about them at Reason’s Surface Transportation newsletter.